Building a uniquely shaped treehouse was not always the dream of novice carpenter Joel Allen, but was actually born of a game between he and a fellow builder. When Allen began his career he found himself living out of his car, not unlike some of his other fellows. However Allen and a friend began turning this impoverished lifestyle into a friendly competition that they called "sport sleeping," where each of them would try and find the strangest or most adventurous place to bed down. After sleeping in logs, on scissor lifts, water towers, and more, Allen began dreaming of a small forest dwelling of his very own. 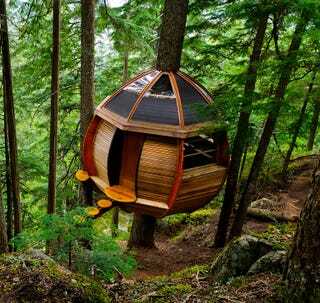 As he discussed the idea with friends, the egg-shaped Hemloft was born. With no money for the project, Allen scouted the perfect piece of government land on which to build his clandestine treehouse. Once he found the perfect tree, he began working single-handedly to build the wooden egg, eventually enlisting the help of the woman who would become his wife. During the construction Allen managed to gather over $10,000 worth of free materials from the internet and finish off his oval opus. After staying in the Hemloft for a small amount of time, Allen left the site, unsure what to do with the structure since it does not own the land on which it is perched. For a time he simply encouraged interested visitors to seek it out and use it for themselves, but in 2013 he gave the structure to the Canadian Wilderness Adventures company who has dismantled the structure and plans to rebuild it as part of a collection of repurposed and recycled dwellings. Unfortunately, so far the Hemloft is still grounded.